Accenture runs five operating groups, organized by industry. Those are: strategy, consulting, digital, technology including application services, and operations to deliver end-to-end services and solutions to clients. In 2017 over 27% of revenues came from products, while over 21% from financial services and over 19% of communications, media and technology. North America is the largest market for Accenture. 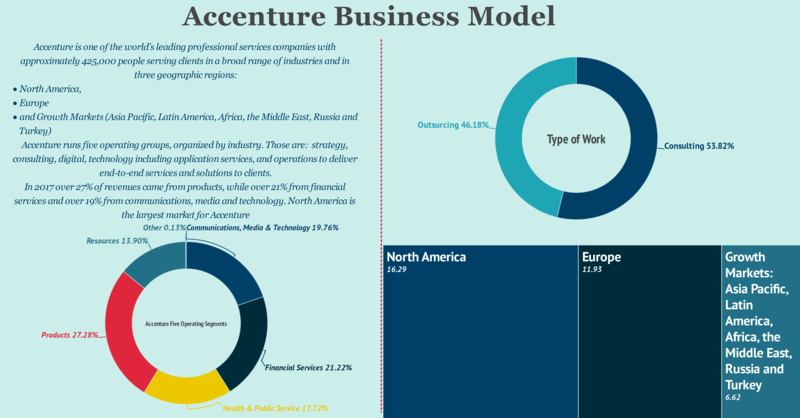 Accenture five operating groups are Accenture’s reporting segments and primary market channel, organized around 13 industry groups that serve clients globally in more than 40 industries.